So that's how Superman did it. Perfect for a funeral, if you're in the coffin! Pink underwear, how dare he! Or for a male stripper when you need to rip your clothes off in a hurry! that is what they use for funerals... why waste a good suit on a dead guy? "Perfect for a funeral, if you're in the coffin!" That probably exactly what it's for. For employees who see their boss once a day and want to do just enough to scrape by! 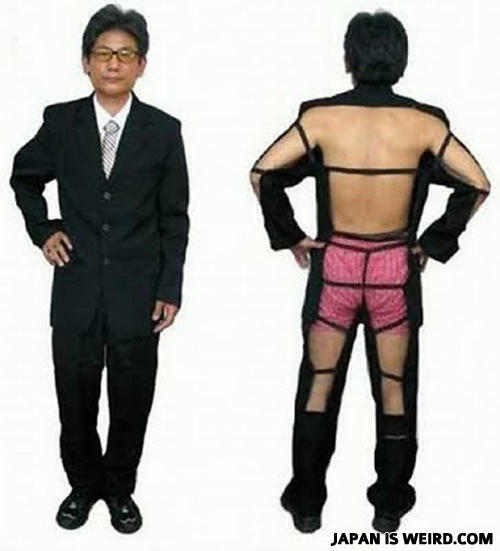 And with the purchase of his tear-away suit, Toshio became the best male stripper in Japan.